“Health Casual” restaurant Freshii (https://freshii.com) has experienced impressive growth since its founding in 2005; it has grown to 85+ locations in 20 countries. Headquartered in Chicago and Toronto, Freshii’s franchises serve an appropriately fresh menu of burritos, soups, salads, frozen yogurt and juices in a hip, trendy restaurant environment. We had the chance to speak to a Freshii representative about the company’s history and growth, and what it means to be a middle market company. Tell us a little about the background of Freshii. How did the company get its start? While working in New York City for the iconic fashion designer Oscar de la Renta, 23-year-old Matthew Corrin had an idea. He noticed many fresh “mom and pop” delis and was determined to successfully brand the much-needed “health-casual” dining category. In 2005, without any experience running a retail or restaurant operation, Matthew opened the first Freshii location in Toronto. Freshii’s mission is all about fresh and healthy fast food. Why do you think this is resonating with consumers so strongly right now? People care more about what they are putting into their bodies, and Freshii helps people eat healthy without sacrificing flavor. Our brand is committed to its global mission: to help citizens of the world live better by making healthy food convenient & affordable. With a diverse and completely customizable menu of breakfast, salads, wraps, bowls, burritos, soups, smoothies, juices and frozen yogurt served in an eco-friendly environment, Freshii caters to every dietary and taste bud preference. With 60+ ingredients and homemade salad dressings made fresh daily, Freshii makes clean eating convenient, approachable and flavorful. How does Freshii stay on top of the latest food trends, while balancing the need to keep the menu fresh and healthy, consistent with the brand? Freshii evolves with the definition of healthy. Ten years ago, brown rice and spinach were popular menu items, and now, Superfoods, like quinoa and kale, are household names and bestsellers on Freshii’s menu. Freshii is always working to bring the latest health trends to the masses. I see that Freshii uses a franchise model to expand. Can you talk a bit about why the franchise model works for Freshii? The franchise model allows Freshii to expand its footprint under local leadership around the world. Freshii believes in the American Dream, the Canadian Dream, the Swedish Dream, etc. The entrepreneurial spirit is alive and well. The franchise model allows any driven, ambitious and qualified individual to become a business owner. 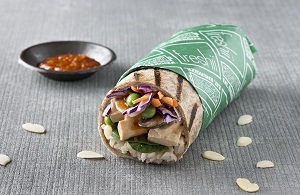 Freshii seems to be expanding internationally very quickly; most recently in Perth, Australia. Why is global expansion important for you, specifically as a middle market company? Guests can visit Freshii anywhere from Toronto, Miami, Chicago and Houston to Bogota, Dubai, Stockholm and Dublin. It is important for Freshii to continue to grow to fulfill this mission of making healthy food accessible and convenient and cancel out the damage of the abundance of greasy burgers. Is it a challenge to maintain quality standards (i.e. freshness of ingredients) in locations as diverse as Columbus, Ohio (thanks! ), Jeddah, Saudi Arabia and Quito Ecuador? Freshii has the sharpest supply chain team in the industry, which has allowed us to maintain freshness of food. The centrally managed supply chain translates to minimal contamination risk and control over what ingredients we serve on the menu. Matthew Corrin set out to build a billion-dollar business in a fiercely competitive industry. Since launching, he and his team have fueled Freshii to grow faster than key players in the business. 1. Talk is cheap. Execution sets you apart. 2. Launch fast, fail fast, iterate faster. 4. Build a killer culture for your business, not a culture that kills your business. Over a decade later, they all still ring true and make an impact on how employees independently or collaboratively approach a challenge. Even after 10+ years of being immersed in the industry, Matthew still believes, lives and breathes the five guiding principles, as Freshii will continue to live and breathe its 5 guiding principles and never become complacent. The five values have led to Freshii’s rapid growth and continue to be the words that Matthew echoes to his team in weekly meetings. Whether launching a new menu item, working through site selection with a franchise partner or dissecting Same Store Sales data, each guiding principle plays a role in the company’s growth. What’s next for Freshii? What are you most excited about? Freshii will continue to expand its footprint around the globe and educate more and more guests around the world about the benefits of living a healthy lifestyle, starting with the fuel they choose to stay energized on the go. We know our model works globally being in 85+ cities across 20 countries. We continue to spend our time and energy vetting prospective partners to ensure that they are the right fit for Freshii and will properly represent the brand in their respective market.